I thought I’d put down what we try to do every morning when we do school. I say try because it seems there are often days when school doesn’t happen. As we get into older grades I need to be more focused on this, but it’s a gradual work towards progress that I’m getting there. Slowly but surely. Each day I have a helper. I printed off each of their pictures and just rotate through them. This becomes more complicated when my kids spread the pictures all out and declare “We’re doing lots of kids helping today Mommy!” They get very excited by this. My helper gets to choose a pointer, right now they’re different eggs from the dollar store. 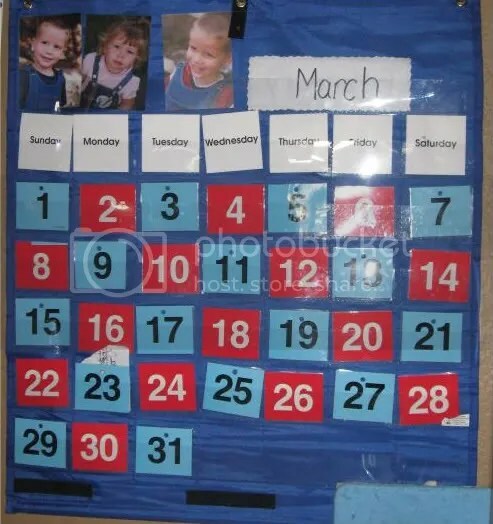 Then my helper says the date, and then helps everyone count up to our day of the month, ex: 1,2 3….27. 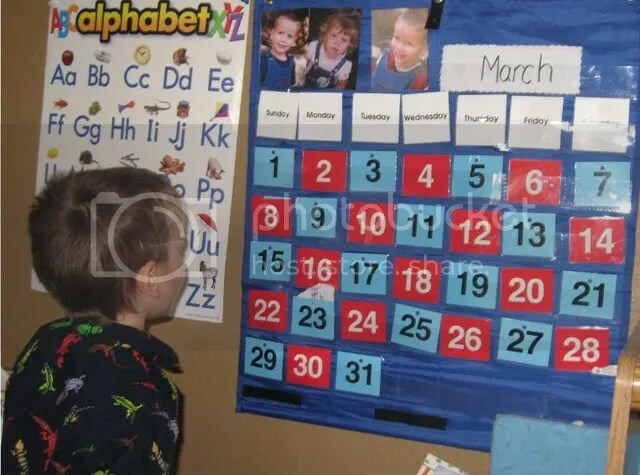 I based this somewhat off what primary kids do in counting days of the school year, but I know mine aren’t up to counting up that high, so we do the day of the month. Next my helper gets to find a letter. I will make a sound and they point to the letter that makes that sound. All of my kids can do this more or less. It’s getting the beginning letter sound that Princess struggles with, but she’s 2, so I’m not worried. She’s leap years ahead of where her brothers were at her age. Next, we do our flannel board math. 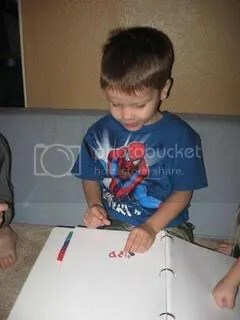 My helper passes out the flannel boards and each kiddo gets a set of 10 pictures. These are from the Beginners Counting Set. Then my helper chooses a number for everyone to count to. Honestly they’re still struggling with counting, so I’m trying everything I can think of to help them out. After this we get out our sticker books. 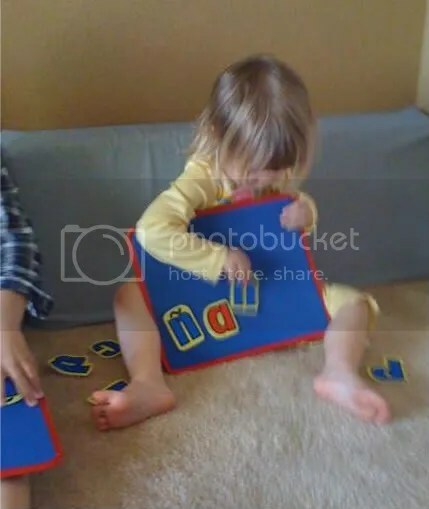 We spent a day going through and putting alphabet stickers on 26 different pages, and I bought some alphabet dividers. Now, each morning my helper gives them each a sticker. The downside to this method is Batman has 3 lions on his L page because he loves lions. The upside is they have true ownership of this book and will sit there paging through it and pointing out the different stickers. I’ve been collecting stickers for quite a while, and I also got a sticker maker, so now anything they want can be made into a sticker as long as it isn’t wider than 5 inches. We also glue things in and will glue in craft projects when we do those. Finally, we make words. This is mainly for the boys who are ready for it, but Princess gets to sit in on it. I got a bunch of felt letters, which really weren’t quite what I wanted, but I’m going to make do because I don’t want to buy more. And, so far we’re just working with the words from a reader from Reading A-Z , I have a bunch of samples from them and intend to join. My hope is to have them confident enough so they transition easily into reading. We’ll see. So, that’s our morning routine. I’ll be posting soon about our stations we work at. Those I’m still refining because I haven’t found any really great ones yet. It’s a work in progress. 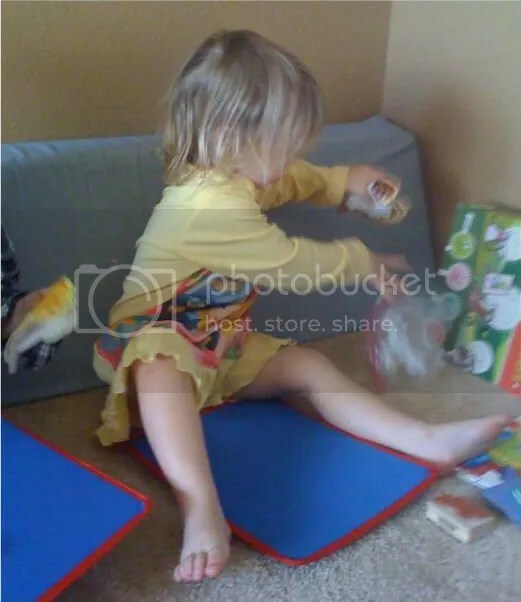 This entry was posted in routines, tot school by Amanda. Bookmark the permalink. I cann’t wait until my LO gets older so we can do some of these wonderful activites! Those are a purchase at Lakeshore learning, they’re called lapboards and are about $10. I have also made a flannelboard, and can make a post on how to do that. I made a large one that’s about the size of a sheet of posterboard. I love the lapboards. RockerTot loves all of his felts so much. Thanks for sharing your morning routine! !